A baby elephant who fell into a steep-sided watering hole in Africa was determined not to die. Bruises appeared on her battered body as she struggled to get free of the hole that could have been her final resting place. 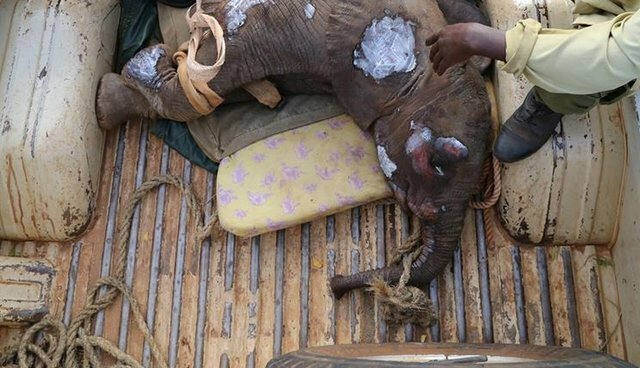 It was early morning on August 14 in Kenya when people from the Taita Hills Wildlife Sanctuary noticed the baby elephant, totally alone and fighting her impending fate, near the Godoma settlement. Conservancy scouts from the sanctuary immediately pulled the baby to safety. Then, they waited. They hoped that her herd would return for the baby, so young she was still dependent on her mother's milk. But it was unclear how long the baby had been struggling and there were no signs of a herd in the area. That's when the David Sheldrick Wildlife Trust (DSWT) and its expert elephant keepers were called. "For an elephant, family is all-important and it is vital for a young orphaned elephant to feed soon after rescue," Rob Brandford, executive director of the DSWT (U.K.), told The Dodo. "A calf's very existence depends upon its mother's milk for the first two years of life, but through stress and exposure to the elements, the condition of these vulnerable calves can deteriorate very quickly." 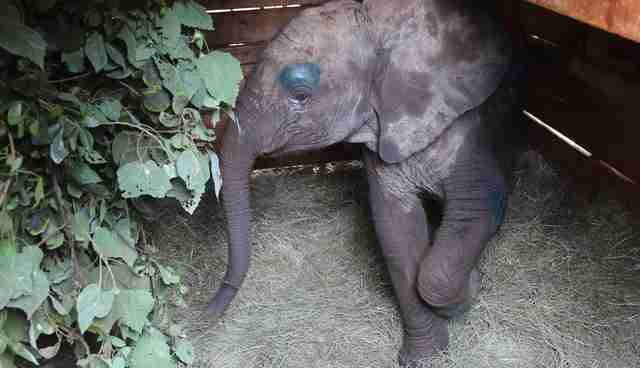 They brought sorely needed elephant milk formula for the baby, as well as hope for her future. "The most testing time for us is during a rescue. Our teams must ensure they are ready and prepared with the medical supplies, equipment and treatment needed for the flight and rescue operation," Brandford said. 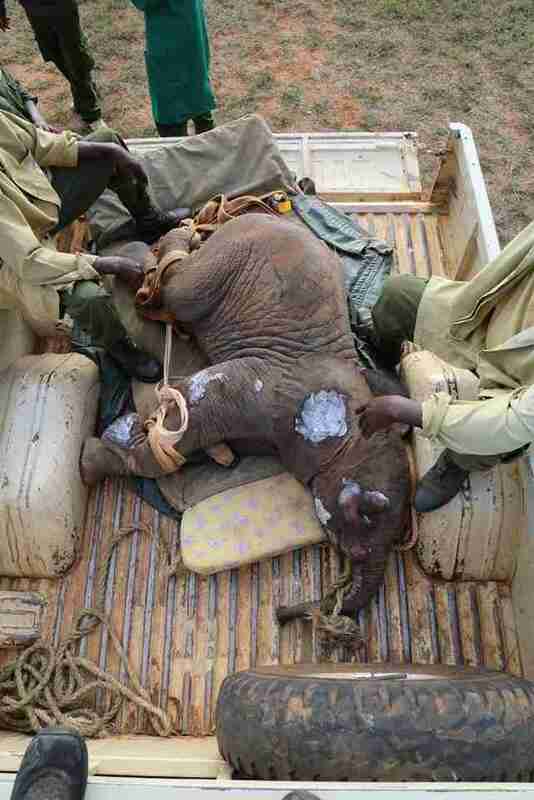 In a bittersweet but necessary decision, with her family nowhere in sight, the lost baby elephant was flown to DSWT's orphaned elephant nursery for longer term care. 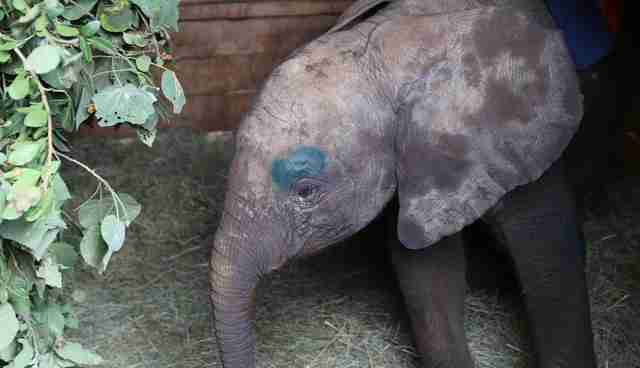 "She cried much of the night, missing her lost family enormously," DSWT wrote on Facebook. "With the reassuring company of the rest of the Nursery orphans along with loving tender attention from her keepers she eventually settled." The baby was named for the valley, Godoma, near where she nearly lost her life, by the incredible people who found and rescued her. Godoma is just one of many elephants impacted by external threats. "Elephant poaching kills one elephant every 15 minutes, but the issue of human-wildlife conflict and habitat destruction also poses a real threat to all elephants that should never be forgotten," Brandford said. The DSWT has rescued several elephants that have become orphaned through conflict or by falling into water points during their migratory passes in the past few years. "Our vets have treated many elephants speared or attacked during conflicts over water and land," Brandford said. "As habitats diminish, the chances of conflict between this iconic species and man only increases." 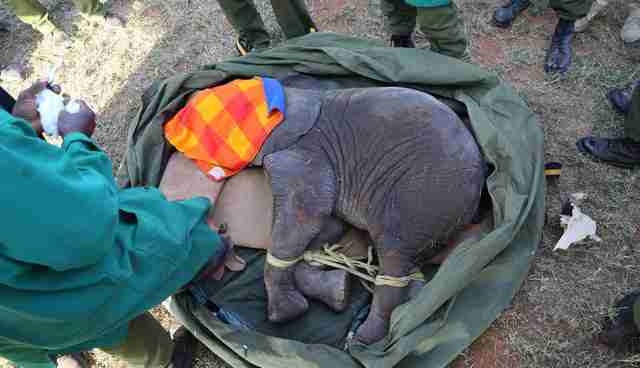 Learn more about the elephant orphans at the DSWT here.